Should You Spay a Pregnant Cat? So you were a little slow in having her spayed and your cat turned up pregnant, or a pregnant stray adopted you. Perhaps you are working with a rescue group and this is your first fostering experience with a pregnant cat. Where do you go from here? Your first major decision is whether or not to allow the pregnancy to continue. 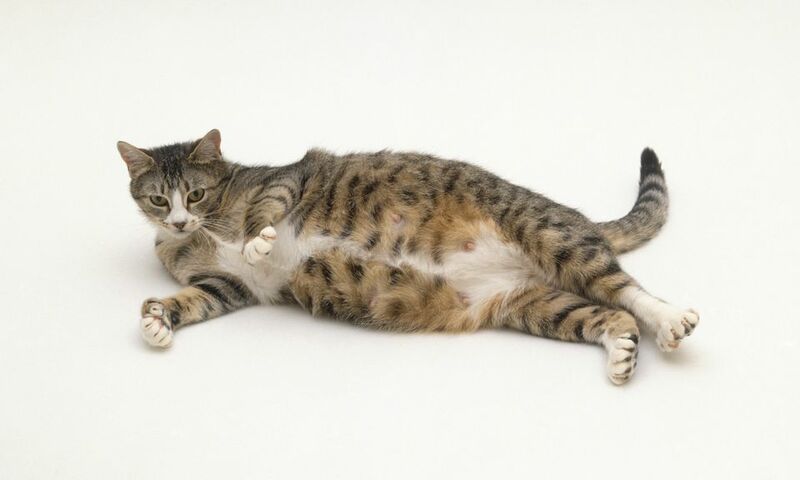 Pregnant cats (called queens) can be spayed, but the decision will depend on a number of factors, which you should discuss with other family members, along with your veterinarian. Spaying a pregnant cat terminates the pregnancy, making this a controversial issue. Some people are repulsed at the thought of killing kitten fetuses. Others believe that additional unplanned kittens only add to the pet overpopulation problem. Should Pregnant Cats Be Spayed? Spaying of a pregnant cat includes abortion, a word that involves emotional reactions, whether applied to humans or to cats. This issue is emotional on both sides. Proponents don't like having to take lives of unborn kittens, but their position is based on pragmatic reasoning. Opponents simply do not like the taking of lives under any circumstances, whether born or unborn. Many animal shelters will automatically spay a pregnant cat that comes into the shelter. Some no-kill shelters may allow the mother cat to give birth, especially if the pregnancy is late-term. There are still some rescue groups that opt to never spay a rescued pregnant cat. There is an enormous cat overpopulation problem that is partially caused by cat owners' failure to spay or neuter their cats. The resulting pregnant female cats may be thrown out on the street, where they and their surviving kittens continue to mate, and the offspring from those matings continue to mate. The horrifying reality is that a pregnant female cat and her descendants can account for the births of several hundred kittens in just a few years. Spaying a rescued pregnant cat can certainly help contain the overpopulation problem. There are simply too few homes for the huge number of homeless cats. Preventing an unplanned litter may also help prevent the deaths of living cats and kittens. Even though a pregnant female cat might be adopted by the finder, with good homes waiting for her kittens, each of those kittens will indirectly be responsible for the death of a shelter cat or kitten that might have been adopted into one of those homes. Of course, there is no evidence that the people who plan to adopt the mother and/or kittens would have gone to the shelter instead. Perhaps they weren't even looking for a cat until they heard a friend, neighbor, or co-worker had adoptable kittens. An individual who is willing to keep both the mother cat and the kittens or find good, permanent homes for them, should not be made to feel guilty for allowing the birth. If the pregnant cat is very young, very old, or in poor health, the pregnancy could cause even more problems. The kindest and most compassionate action anyone could take with one of these cats is to spay/abort her. How "far along" is the queen's pregnancy? Although early and mid-term spay and abortion of pregnant cats is common, late-term abortion is generally not done. If this is your own cat, you can estimate how far along she is by the date of her last estrus cycle (heat). Otherwise, a veterinarian can estimate the term for you. A very young cat (under one year) or an older cat (eight years and older) may have a hard time with birth, with the possibility of deformed or stillborn kittens, or the death of the queen. In addition, birthing and nursing a litter of kittens may have a negative effect on the mother's health. What is the cat's general physical condition? If she is in an overall good condition and in late-term pregnancy, you may decide to let the pregnancy continue to parturition (birth), depending on other factors. If she is in poor physical condition, the pregnancy, birth, and nursing may endanger the mother cat. How well-equipped is your household for caring for newborn kittens? This is a huge commitment, and everyone in your home will be involved at one point or another. If you have a safe room where you can confine mother cat and kittens safely from the intrusion of other cats, dogs, small children and the like, you may be okay. Otherwise (in the case of a stray), you should probably turn the job over to experts, such as local rescue organizations. How equipped are you to place the kittens and mother cat into good homes? If you are one of those families who have plenty of room for more cats and is financially able to care for the additional cats, then it may be realistic to keep the mother and kittens. If you're thinking of finding homes for the kittens, be selective in your screening process. Which is the more humane decision? In the case of a pregnant feral or stray, would it be more humane to spay her and put her back onto the streets, or to try to rehabilitate her for placement into a new home with or without her kittens? If you've decided to let your queen have her kittens, you likely have a number of questions about how to take care of your pregnant cat. A good place to start is with your veterinarian. Your main responsibility will be to feed a high-quality diet formulated for growth and to maintain a comfortable environment for your pregnant cat. A queen's gestation period typically runs from 57 to 69 days, with the average of about nine weeks. By the time you notice she is pregnant, she'll likely be at least three weeks in. By six weeks pregnant, it becomes more apparent that she is pregnant. At this time, your vet can take an x-ray to count the number of fetuses. Litters can range from one to eight or more kittens, with an average of two to five kittens, with maximum numbers occurring with queens between the ages of two and eight. It's helpful to know how many kittens are expected before the mother cat gives birth. Although your cat is unlikely to need your help during labor and birth, complications can occasionally arise. You will be able to tell if she is in distress between kitten births if you know how many are expected. You can watch her give birth from a safe distance, only intervening if there's a problem.